The first Austin City Limits music festival was held at Zilker Park in 2002, and Tito’s Handmade Vodka joined the fun the next year when R.E.M. and Al Green headlined. That first year of Austin City Limits (ACL), Tito Beveridge—founder and master distiller of Tito’s Handmade Vodka (and devoted music fan)—worked by himself pouring samples, mixing drinks, and spreading the word about the vodka that he was distilling right down the road. Word of mouth has always been a pillar of how we like to do things around here, and it worked so well the Tito’s Sweet-O became one of the first cocktails at ACL. Through the years, Tito’s has continued to play a crucial role in the ACL festival experience for artists and attendees. In 2015, we had a dedicated stage, a Plinko Parlor featuring festival prizes, and a dedicated Tito’s Lounge that felt like a mid-festival oasis for our friends, fans, and families for the very first time. ACL is an annual music festival that gathers people from around the world in Austin for two three-day weekends of live music. The festival has eight stages where musical groups from genres like rock, indie, hip-hop, electronic and more put on a show for approximately 450,000 fans each year. Learn how we're giving back to Meals on Wheels PALS! The friendship between these two Austin originals continues to evolve every year, and we are a proud sponsor of the festival and thriving spirit of music that encompasses Austin, Texas. 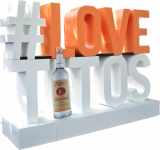 This year, head to the Tito's Stage to see an electrifying line-up, swing by the Stillhouse Lounge for a Tito's cocktail (or two), and visit our Love, Tito’s Experience to support Meals on Wheels PALS. Join us in making a pledge to do good at our digital time capsule and learn how we are turning spirits into love and goodness. Check out Austin City Limits. Just add Tito's Handmade Vodka and sweet tea to a collins glass over ice. Re-live some our favorite Austin City Limits moments!